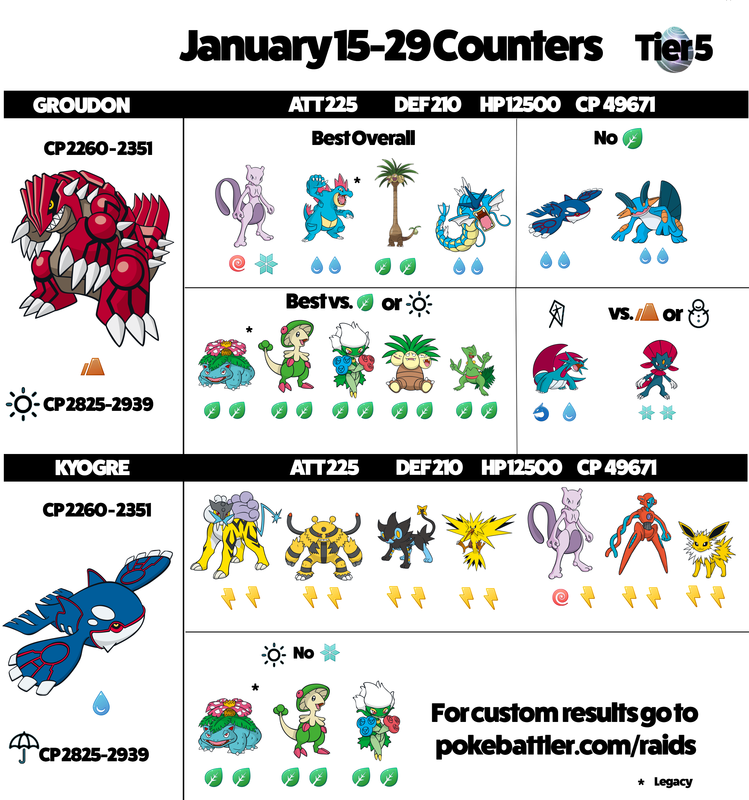 Groudon and Kyogre are back again for just two weeks from January 15th-29th. Since the last time they were here, Niantic has updated super effectiveness, increasing the damage boost to a whopping 60%. This has made both Groudon and Kyogre easier to defeat but also increases the risk of your Pokemon dying before they are able to use a special. To use this infographic, you can often look at the in-game auto-suggest to estimate which move each raid boss has. Groudon is the trickiest of the returning Gen 3 legendaries. Depending on the special move it has, you’ll want to use different counters. 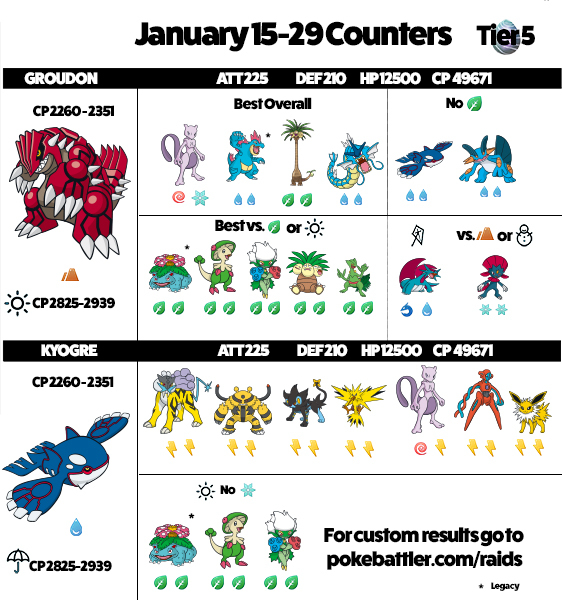 If you aren’t sure, we recommend the best overall counters: Mewtwo, Feraligatr, Alolan Exeggutor, and Gyarados. However these aren’t the strongest for each situation if you do know what moves its got. Groudon remains best ground Pokemon is the game so he’s definitely worth your time. Earthquake: Easiest move to defeat. You want to use strong grass and water Pokemon for this. Solar Beam: Hardest move to defeat. You want to use strong grass types against it. Fire Blast: Best to use water types against it. The best moveset you want to catch is Mud Shot/Earthquake. Solar Beam is second best, but with the addition of community Venusar and Breloom, it’s no longer as great a choice for a grass move. Kyogre is an easier battle to prepare for than Groudon due to the overwhelming strength of electric Pokemon against it. There are many strong options to choose from but Thundershock and Wild Charge are especially amazing together. Kyogre is still the best water Pokemon is the game so although you may already have a few good ones, it can’t hurt to add to your collection. Blizzard: The hardest charge move to defeat. Don’t use grass Pokemon against this ice move. Hydropump: Grass Pokemon do better here but still not as strong as electric. Thunder: This is the easiest to defeat. Once again electric Pokemon are the strongest counters but grass types are usable. The best moveset to catch for Kyogre is still the ever formidable double water Waterfall, Hydropump. Kyogre and Groudon are only here for two weeks. They’re available in shiny form now which adds a little extra excitement, if that’s your sort of thing. Either way they remain super strong Pokemon and are definitely worth catching more of. Why is Kyogre listed only in no-solar beam while Feraligatr is not? Kyogre often dies before being able to get a hydro pump off. Hydro Cannon is a 2 bar move so it doesn’t have that problem.